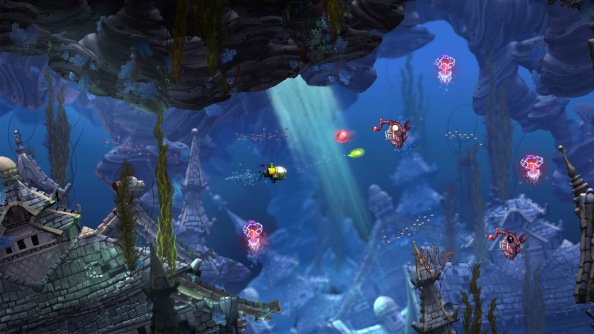 Song of the Deep, an underwater adventure which evokes both the sidelong reef navigation of Derek Yu’s Aquaria and the storybook vibe of Child of Light, is deep in unexplored territory. Not only is it a PC game from the famously-not-on-PC Insomniac, but on July 12 it’ll also become the first game published by famous non-publishers GameStop. Got a penchant for feeling out frontiers? Play one of the best space games on PC. The metroidvania-style ocean explorathon casts the player as Merryn, a woman whose fisherman father goes missing at sea. Building a homemade but sturdy submarine, she descends into the depths to find him. The story has ties to Irish mythology, but the trailer suggests less-traditional shoot ‘em up mechanics too. This isn’t actually Insomniac’s first PC game – that honour was claimed a little over a year ago by Slow Down, Bull, which you most probably missed. It was a quiet one. There are also two Insomniac VR games in the works. Publishers GameStop enjoy exclusive rights to sell Song of the Deep’s boxed version, which would potentially be a faff for those of us outside of the retailer’s domain – if not for the Steam edition also launching in July. Think you’ll pick it up there?